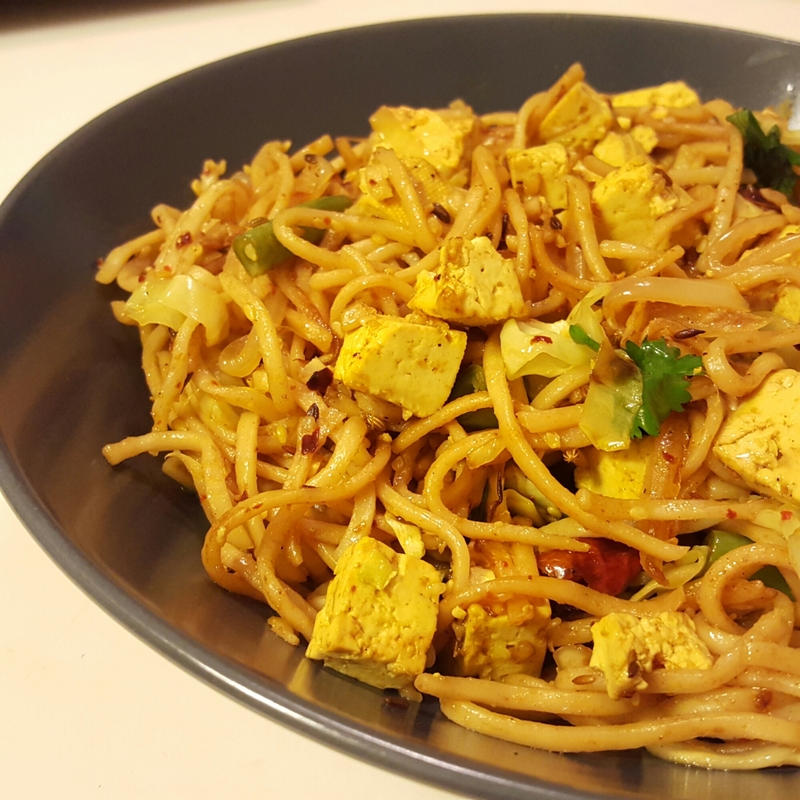 Vegetarian Pad Thai – Eat, Click, Travel and Repeat! 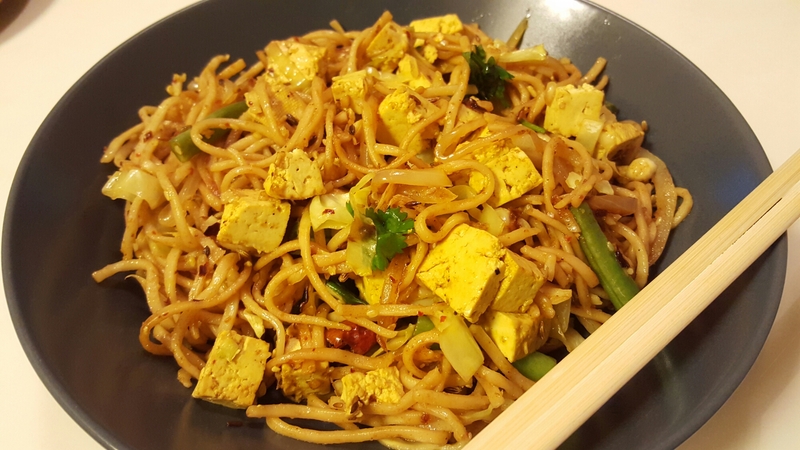 I have tried this personal version of vegetarian pad thai by mixing two different recipes. First part of my inspiration was Instagram. This social media application is a great way of following Indian food bloggers. The incredible women I follow have great pictures (recipes) to share and inspire novices like me in this field. One recipe by Radhika.S (Tickling Palates) caught my attention. This recipe was of Jodhpuri Aaloo. Since, I am trying to reduce the carbs I incorporate in my diet. I had an idea of compliment the ingredients of this recipe with tofu, instead of the small baby potatoes. 2nd part of this recipe is stuck in my head since I ate some really great tasting thai food in Amsterdam and Sweden. It had tempted my taste buds. I wondered if it’s possible to create the vegetarian version of Pad Thai that I usually get in these restaurants at home. So the culmination of these two thoughts led to the following recipe. I enjoyed making this recipe. It tastes simply incredible and very close to the Pad Thai recipe. It was a struggle to think of a creative name for it, hence current name of the dish. The ingredients I used are easily purchasable and can fall in usual grocery list. There is no need to go to special shops for making this dish. Take a pan and add oil. Add cumin seeds, sesame seeds and fennel seeds to the oil. Roast it for few minutes. Break the dried red chili and garlic ginger paste in the oil. Add diced tofu in this oil. Follow it with turmeric, red chili and coriander powder. Mix the tofu in the oil and stir fry them for few minutes. Add salt and red chili flakes to tofu. Boil wheat noodles for 7-10 minutes and keep them aside. Take a new pan and add oil to it. Fry sliced onions, garlic and peanuts for few minutes. Add cabbage and french beans. Cover the pan and cook them on low heat for few minutes. Add the boiled wheat noodles in it and mix with the vegetable mixture. Add vinegar, soya sauce, chili sauce and tamarind paste. Make sure the noodles thoroughly coated with sauces. Add the stir fry tofu. Sprinkle salt and pepper to taste. Garnish with coriander leaves and serve it hot! Yummmmm… this looks so tempting….! !